More info:From £1545 - £1599 excluding flights. Prices based on 2 adults sharing. Single supplement available. Mimimum age 14. Journey through the Ecuadorean Andes from Quito to Guayaquil on a 16-day small group tour that immerses you in the region’s astonishing culture and history. From UNESCO World Heritage Sites to indigenous markets and villages, thermal resorts to Panama hat factories, and of course the mysterious Amazon rainforest, this is a fast-moving, ambitious tour that will captivate you from start to finish. You’ll pass the Quitsato Equator monument – ‘the middle of the world’; wander the famous and colourful Otalavo Market, the perfect place to pick up your souvenirs; watch a performance of Andean pan pipe music in a local Indian community, and explore the Amazon by canoe with an indigenous guide for a fascinating introduction to traditional medicines. You will soak up the minerals and the scenery combined at a thermal resort 3300m above sea level, taste fermented ‘chicha’ in an indigenous village, and enjoy a factory tour to learn about the production process behind one of Ecuador’s best-known exports: the Panama hat. Cotopaxi National Park, home to the world’s highest active volcano, is a jaw-dropping destination to spend a few days, but it’s closely rivaled by the famous train journey to Sibambe on the way to Cuenca, aboard the ‘Devil’s Nose’ train- this triumph of railway engineering sees the track drop 800m into a deep gorge, an incredibly exciting journey. Cuenca, which has produced some of Ecuador’s greatest intellectuals, artists, poets and writers, is sure to be a cultural highlight before you reach the culmination of the tour in Guayaquil. This, of course, is the gateway to the spectacular Galapagos Islands, and if you’d like to arrange an extension of your tour to see the islands and their unique flora and fauna, it’s easily done. 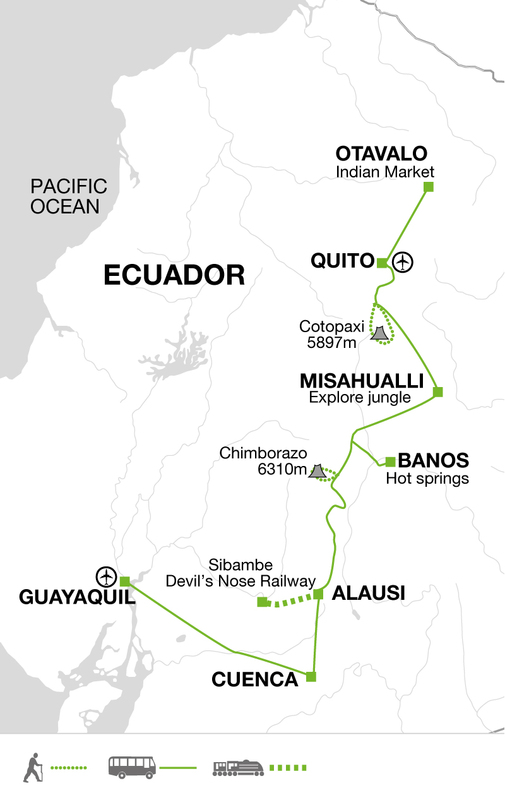 Expect to be wowed at every stage of this sensational Ecuador holiday. "In Ecuador you will be accompanied by our local staff, which is the best way to learn about the local culture and customs, as well as generating local employment through our business. In 2009 our Ecuadorian Tour Leader Diego Torres was crowned overall best tour leader at the prestigious “Wanderlust Paul Morrison Guide Awards”, thanks to his encyclopaedic knowledge, great empathy with his groups and his passionate concern for developing tourism in Ecuador in a sustainable and responsible way. Diego donated his £5,000 bursary prize to the charity Proyecto DCR that gives vulnerable street kids in the capital Quito the chance to get an education. Diego is still a big supporter of this charity: “It’s such a worthwhile project because it gives the children the potential to take charge of their futures. Instead of having to beg on the streets they can have a life with more dignity”, and during your tours to Ecuador he'll tell you about their latest initiatives. Throughout Ecuador, we strive to work with hotels that are responsibly operated. The lodge that we use in the Misahualli section of the Amazon jungle is a great example of this. They only use biodegradable products and low-energy lightbulbs, and save rainwater for use. They employ local people in the communities and purchase all food and building items locally. "